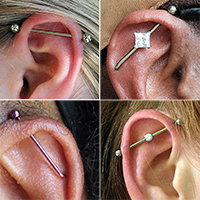 An industrial piercing is 2 cartilage piercings connected with a long bar (most commonly 2 helix piercings). This piercing does require an anatomical consultation with the piercer for viability. Please read our FAQ:Minors for required paperwork.